Are you or your organization currently using more than five digital marketing solutions or complex enterprise analytics ones such as Adobe Analytics? In the event this is the case, then a solid tag management system can definitely benefit you. Furthermore, if you’re in the process of expansion or thinking of increasing your performance marketing activities, then you should definitely consider a tag management system to help you increase both your agility, efficiency and the implementation of your campaigns. Did you know that according to a recent Econsultancy and Tealium report, a whopping 87% of digital marketers feel that a tag management is literally the key to their success when it comes to their online efforts? So then, why is it that so few companies have taken the action to officially jump onto the tag management system (TMS) technology bandwagon? Well, the truth of the matter is that many businesses all too often find themselves preoccupied with the meat and potatoes of matters, so to speak. You know — marketing, lead generation, business operations, customer service, yadda yadda yadda. While most companies understand the necessity of digital marketing, many business owners find themselves in a situation where processes such as tag management are all too technical for them. 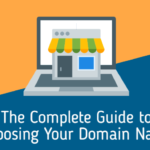 So, unless you’re a business owner who is wholly familiar with the topic, then the success of your company’s tag management strategy lies in the fate of your digital marketing team. …And in a world where it often seems that every freelancer totes the title of digital marketer, that can be a problematic scenario. benefits of Google’s Tag Manager, then look no further than these next few lines. 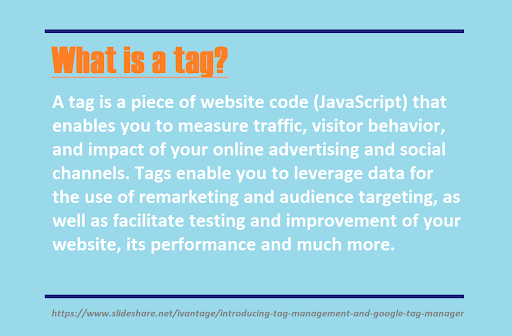 Essentially, tags are “a means to collect and move data between a website or mobile app session, and the technology vendor”. Tags are also often referred to as pixels and can additionally be used to collect important information on the behaviors of your website visitors. Strategically managing data foundations –User-friendly, intuitive interfaces built to enhance organization of messy, daunting data. Increasing agility – By utilizing a TMS, digital marketers are now easily able to change variables in coding and launch campaigns more efficiently than before. Reducing costs – Tag management previously has required ongoing IT assistance in order to support. Increasing website performance – Intelligence coupled with superior architecture equals increased page load times. Pretty much every marketing technology out there requires the implementation of tags, and the number and level of complexity is only going to continue to rise as more data-driven tools get thrown in the mix. You really can’t afford to not be prepared. Do You Need a Tag Management System? Let’s face it, not everyone out there is going to need a tag mangement sytem, but the truth is that all too many individuals and businesses out there are operating without one when they need it. 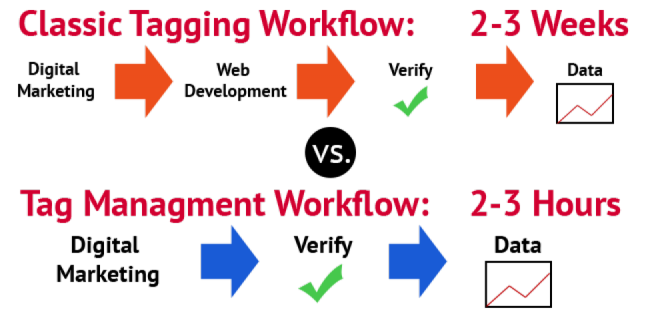 So how do you determine whether or not a tag management system is for you? Well, there’s a few general guidelines to help you decide. Companies using or thinking of deploying mobile apps will also find that tag management systems provide the same benefits to mobile apps as they do for websites. Speaking of websites — how’s yours doing? If you’re currently thinking about redesigning your website now or in the future, then concern over “maintaining analytics and campaign continuity” should be of paramount importance. A good tag management system can help give you the peace of mind that nothing will be compromised. Lastly, a tag management system is a perfect those who desire flexibility and freedom when it comes to their marketing vendors. Google Tag Manager (GTM) has come quite a ways since its initial launch back in 2012. Since its original inception, auto-event tracking has been implemented and various UI changes have been made such as making the platform wizard-driven in order to help facilitate ease of use. There are several benefits to using GTM over other enterprise platforms, the biggest two being that the base version is absolutely free and — it’s Google (hello!) — so you have the peace of mind that you’re in good hands. Another benefit is that this same version is catered specifically to individuals and medium to small-sized businesses. This makes it an excellent option for entrepreneurs, individual digital marketers and small startup agencies alike. Furthermore, surprisingly enough, you’re also getting a pretty robust tag management platform, all things considered. Google offers easy-to-use error checking, the ability to add or modify tags as needed and it also offers turnkey templates for various Google and third party tags for both web and mobile apps. For those with several key players to consider, GTM gives you the ability to collaborate across your organization with multi-environment testing, workspaces and “granular access controls” to facilitate efficiency. When we say the platform is robust, we kid you not. In addition to multi-user support, rule-based triggers, and support for Google and non-Google apps, GTM also supports web, mobile app and accelerated mobile pages (AMPs). Users can also rest assured that they also get access to preview options and debug tools. The workspaces are perfect for concurrent tagging projects and with the base version you get up to three. 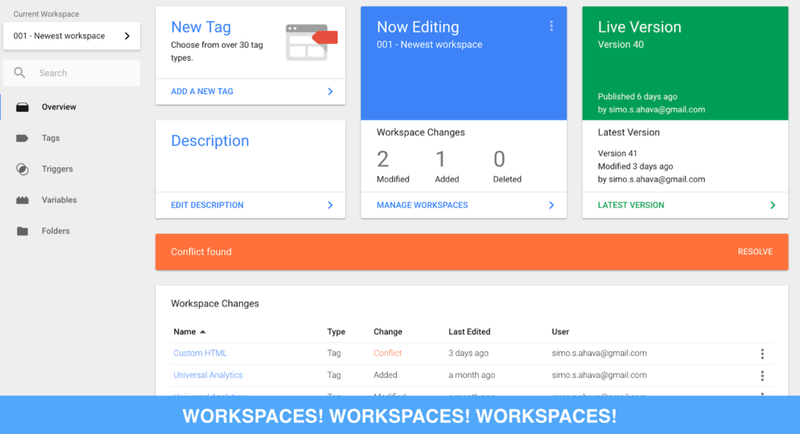 Organizations looking for a bit more freedom can always upgrade to GTM 360, which offers unlimited workspace solutions. GTM 360 also offers approval workflows and zones for “large-scale implementations and to controlled access tagging” — features which the base version does not have. It’s also worth mentioning that there’s user and account administration and you can get plenty of customer support and services from Google which include a a self-service help center as well as community forums. 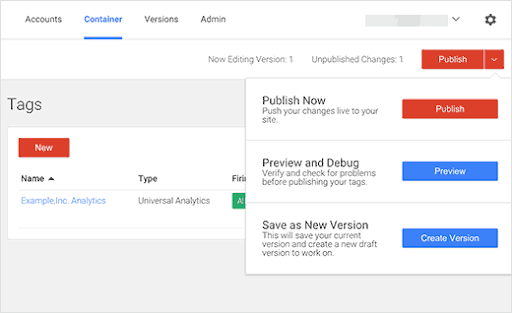 When it comes to using Google Tag Manager, newbies can rest assured that they’re in good hands with a platform that takes UI as serious as a heart attack. When you break it down, you are really only six steps away from your goals. Setting up an account with GTM is pretty simple. All you have to do is list an account name (GTM recommends your company name) and set your location. You also have the option to share data anonymously with Google and their partners — an option you can obviously also opt out of. The second step involves container setup. During this process you will enter your website address and specify where you would like to use the container (web, iOs, Android, AMP). Once this information is entered, Google will prompt you to agree to their Terms of Service. For those looking for a little bit more assitance, they can visit their Quick Start Guide via the link listed at the bottom of the screen. …And for those of you with WordPress, you can take a nice sigh of relief knowing that the platform makes it quite easy for you to do this on your own. All you have to do is head on over to Appearance, then click on the Editor. On the right-hand side you’ll notice various files which make your template function. All you have to do is locate the Header.php file and edit it to paste the top portion of the code right after the <head> element. The second portion goes in right after the <body> element. Once this is all squared away, you can begin by adding a tag. Google offers over 50 tag types to choose from. Lucky you! A menu will pop up on the right-hand side giving you countless options to choose from including their most popular “featured” ones, as well as custom tag options. GTM also offers several options from their trusted partners network such as CrazyEgg, FoxMetrics, K50, UpsellIt and more. Once you choose your tag, you have the option to configure it. Obviously the options available vary greatly based on which tag you choose, but it’s also worth noting that you additionally have access to advanced settings. One you’ve finished adding your tag, all you have to do is choose a trigger. This is an action that will “trigger” the tag to perform whichever action it is designated to perform and can be anything from a window loading, a page view, a form submission or even designating a predetermined scroll depth as a trigger. It’s also worth noting that you have the option to list exceptions should you choose. 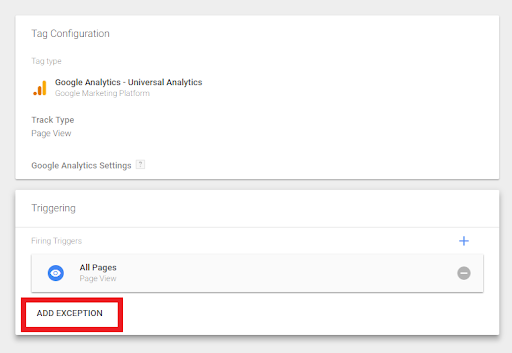 Now, all that’s left is setting up your tracking ID (in this instance), which can be found on your Google Analytics Admin page. Once you’re finished all that’s left is to publish your tag. However, GTM gives you the option to test it out beforehand in order to work out any potential bugs (totally suggested). …And that’s all, folks. 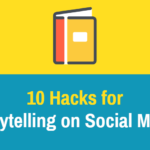 You’re officially a digital marketing rockstar. Implementing a solid tag management system is absolutely necessary for those individuals and organizations looking to succeed in the digital marketing sphere. I mean, there is of course always the option of manually tagging everything, but since recent research found that 75% of those tagging manually find implementations take more than a day, with 47% requiring more than a work week — why would you even bother? 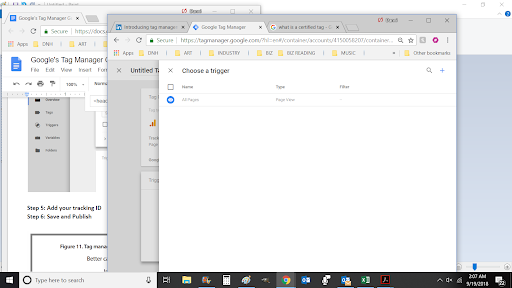 With a good tag management system such as Google Tag Manager, implementation can take you 10 minutes. It’s really a no-brainer. So, how are you feeling? This is some pretty exciting stuff. 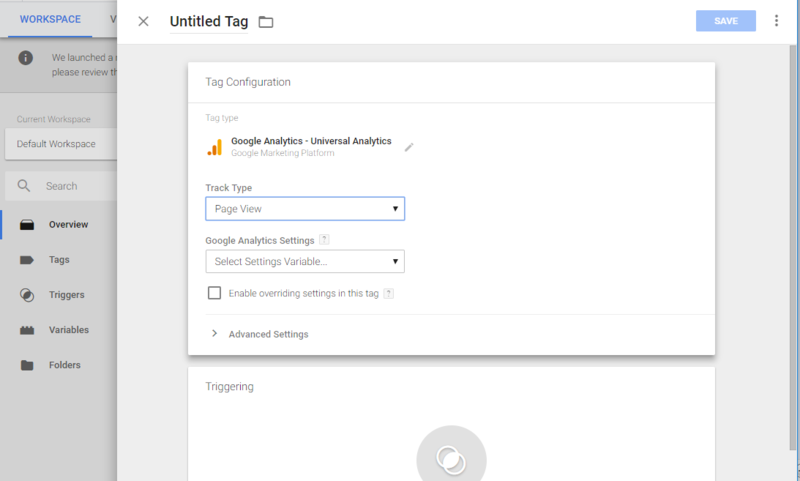 I mean Google Tag Manager literally has the ability to completely change your digital marketing game and take you and your business to the next level and what’s even better — it’s totally free. 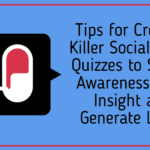 So get on out there and become the digital marketing guru that you always dreamed of all while still being able to leave space in your schedule for a nice long happy hour. It’s okay — it’s our little secret.